Who's ready for a challenge!?! Every member that completes any 15 SaySo Rewards V2 offers between March 20th & 31st will receive 5 Platinum Coins! 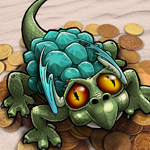 As an added Bonus: For every 5 approvals you get, we'll give you 3 Dragon Scales, 2 Pearls, & 1 Gold Coin! In order to participate and receive your rewards, you MUST post your TT Account # in this thread! Proud of your accomplishments!?! Let us be proud with you!!! Post each time you hit 5 approvals to show off your survey prowess. If there are at least 15 members who get a bonus for 5 completions, we will select one user at random to receive a $1 cash prize added to their account! I only see 6 or 7 in the offers. Are they located somewhere else?